It has been one month now since we cut the umbilical and became full-timers. If we take an audit of our adventures thus far, one would say we have been relatively active and going places. Indeed, a glance at our Pilot-Flying J fuel charge account will verify that we have been moving, seeing new places. But we have met new people, too. We have spent time with my dad and have developed a relationship with his guardian angel, Rea. However most of our human contacts have been somewhat brief encounters like the people who register us at our destination campground. Sometimes we don’t stay very long in one place to see what might develop. There were a couple we remember for their “unfriendliness” and we knew we did not want to stay there. However, most of the people we have met showed promise. Such is the case here at Manatee RV Park. Mike and Sandy are a couple from Pittsburgh staying fulltime in the park. We met them at the steak picnic on the 4th of July that was sponsored by the campground owners. We shared with them our memories of Pittsburgh and they with us. Another Pittsburgher who sat with them was a gentleman (whose name fails me at this time) who told us how he came to be living down here year-round. While he was here last winter he rented out his house back in Pittsburgh. It seems his home fell to the ills of a deteriorating neighborhood in the city and they burned it down along with 4 other old houses on the block. Doreen, who I guess was in her eighties loves to travel. On this Independence Day celebration she was decked out in her red, white and blue patriotic attire that included a ball cap of shiny sequins also in the colors of Old Glory. She has been to every state and commonwealth in our great country except Rhode Island and she cannot figure out how she and her husband missed that. Her husband only wanted to travel in the US so she spent time in Europe and Asia with herself or her sons. Two years ago her husband passed away and she came to the common sense conclusion that their home in Michigan was too much to care for in her advanced years and so she worked up the courage to sell it and come to Manatee RV Park to live and, as you could tell from the tears that welled up in her eyes and the tremble in her voice as she spoke, to die here. Kelley Ann is the RV park’s customer service representative who spoke to us on the phone while we were still in Naples. She sold us on the benefits staying at Manatee RV Park and told us to just find a site we liked, pull-in and hook up as the office was closed on weekends but gave us her cell phone number if we needed anything. We met her face to face on Monday and we were formally registered then but she never asked for our charge card. We realized that we had not paid for our stay on Tuesday and we went to the office and she casually took it from us then. But Kelly Ann enthusiastically told us of all the activities and amenities in the campground which was extensive. She shared with us the story of the owners and a more recent story of the unfortunate illness of the owner’s niece who lives and worked in the park. The young woman gave birth to her first child on Father’s Day this year and a couple of days afterward suffered a stroke caused by a blood clot that has left her severely damaged. As of this writing she has recovered enough to be taken off life support but has not yet established interaction with anyone. She is on our prayer list. Kelley Ann and other staff members visit her in the hospital’s ICU. Betty is one of those women who you would call “vivacious”. At the picnic she made us feel so welcome to this community, commenting on Joanie’s watermelon salad. 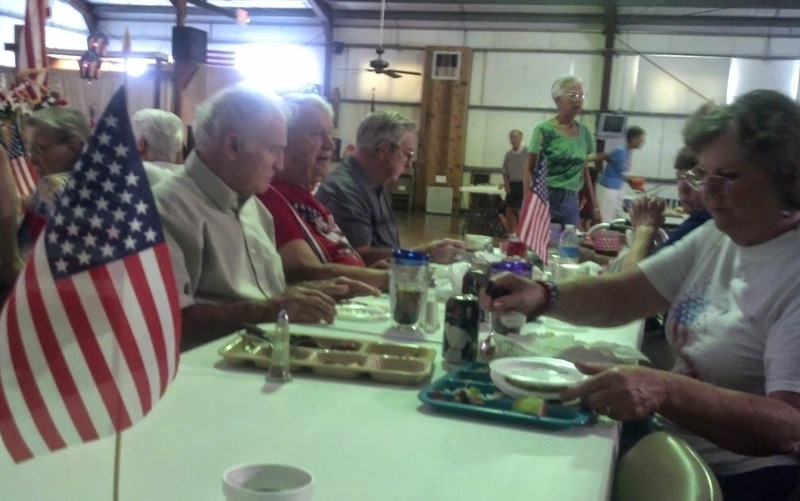 She and her husband wearing matching American flag t-shirts moved through the gathering talking to everyone. She spoke to us no differently than any of the old-timers. Corn hole. Corn hole is not a person but a game we learned to play while at Manatee RV Park. I think they could have come up with a name that was more descriptive and less suggestive. Somewhere in America I have to believe that a better name for this game exists. For those of you not familiar with corn hole it is played very similarly to horse shoes only a lot safer and as a result you can play it in-doors. You have seen this game played at kid’s birthday parties. It is the toss-the-bean-bag-into-the-clown’s-mouth game. Only grown up. I, evidently, am a natural. I believe that I would enjoy being a member of this community someday if I had to. And I believe that we will encounter more communities just like this and people just as lovely in our travels in the future. After all, that is why we travel.